New Brand History Book in the Making. The Brand Book Committee has re-grouped, to offer Deanne additional support. 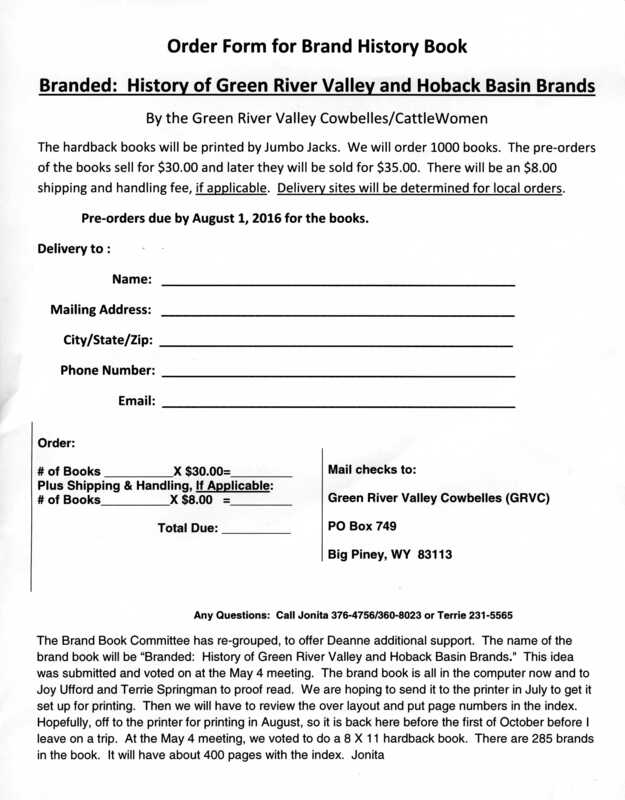 The name of the brand book will be “Branded: History of Green River Valley and Hoback Basin Brands.“ The brand book is all in the computer now and to Joy Ufford and Terrie Springman to proof read. We are hoping to send it to the printer in July to get it set up for printing. Then we will have to review the over layout and put page numbers in the index. Hopefully, off to the printer for printing in August, so it is back here before the first of October before Jonita leaves on a trip. The book will be an 8 X 11 hardback book. There are 285 brands in the book. It will have about 400 pages with the index. The hardback books will be printed by Jumbo Jacks. We will order 1000 books. The pre-orders of the books sell for $30.00 and later they will be sold for $35.00. There will be an $8.00 shipping and handling fee, if applicable. Delivery sites will be determined for local orders. Click here to print Presale Order form for brand history book. New Tote Grocery Bags for sale $8.00. They will be for sale at the Christmas Craft Fairs. The price list for the napkins are as listed here. The members of the Green River Valley Cowbelles/Cattlewomen met on February 27, 2016 for their Annual Convention. The meeting was held at the Daniel School House in Daniel, Wyoming. There was a wonderful participation with 61 members and guests. The officers are President-Jonita Sommers, Vice-President-Sandy McGinnis, Secretary-Brenda Carnahan and Treasurer-Terrie Springman. Newly elected officers are Secretary-Brenda Carnahan and Treasurer-Terrie Springman. The meeting was conducted by President-Jonita Sommers. “Beef It’s What’s for Dinner”-The luncheon menu was Brisket, Cheese Potatoes, Green Salad and cookies provided by The Den. The dignitaries attending were Janet Givens, President of Wyoming CattleWomen, Pat Allman for Representative of Congressman Cynthis Lummis and Travis McNevin for Senator Barrasso. Entertainment was a Sue Briggs-Stanfill doing a musical spoof with Joni Mack playing the piano. Sue Briggs-Stanfill also played sing along songs as we were transitioning from meeting to lunch. Kailey Barlow was the speaker on AG Advocay. Each year, the Green River Valley Cowbelles/Cattlewomen sell places on the quilt for local brands and sell raffle tickets for the Brand Quilt. This project is a major fundraiser to provide local scholarships and promote the beef industry. 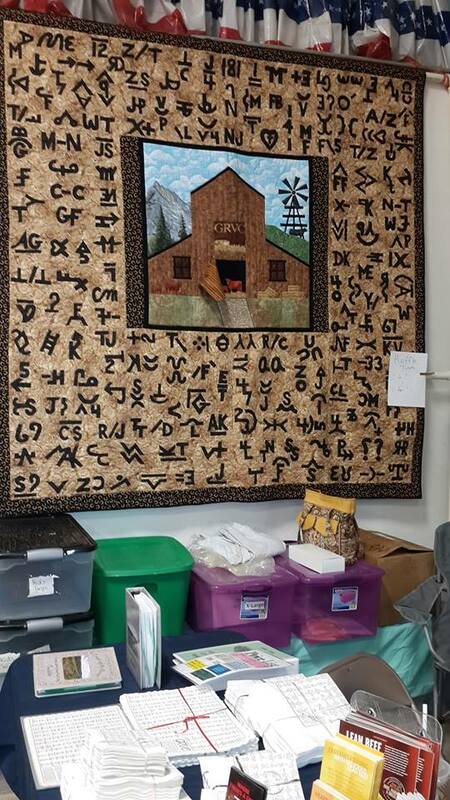 The winner of the 2015 Brand Quilt was Kay Jensen. Recognition of the Lifetime Member were awarded to Beth Bray and Rosemary Aultman during the convention. Susan Bousman was the 2016 Ranchwoman of the Year. The Green River Valley Cowbelles/Cattlewomen and the Cattlemen share the award and recognition for the Friend of Agriculture, which was presented to Bondurant Community Barbeque and they were recognized at the Green River Cattlemen’s banquet that evening. See the photos below. 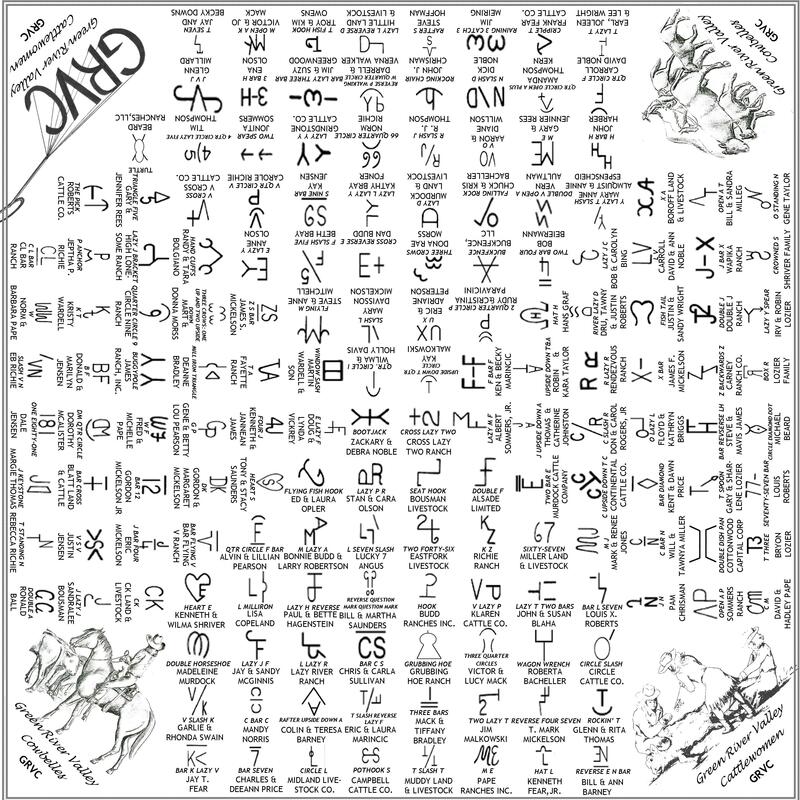 The 2016 Brand Quilt was completed. The 2016 Green River Valley Cowbelle quilt was made by Deanne Bradley (chairman), Marsha Barlow, Ann Barney, Janet Beiermann, Brenda Carnahan, Becky Downs, Terrie Springman, Sherri Bohleen, Wilma Davis, Molly Landers, Rosemary Aultman, Lynda Vickrey, Barbara Pape, McKenna Carnahan and Liz Wardell. It was quilted by Terry Quinn. Raffle tickets are sold for the quilt to make money for the scholarship fund. Tickets will be sold at the Rendezvous in Pinedale July 11 and 12, the Sublette County fair and the Christmas Craft Fair at the Big Piney High School in November and Rendezvous Pointe in December. Rosemary Aultman, Terrie Springman and Jonita Sommers ran a booth for Rendezvous on Friday and Saturday in Pinedale. The Cowbelles were busy at fair. They had their booth with the quilt, scarves, t-shirts and napkins along with information about beef. GRVC served Philly Cheese Steak Sandwiches also.